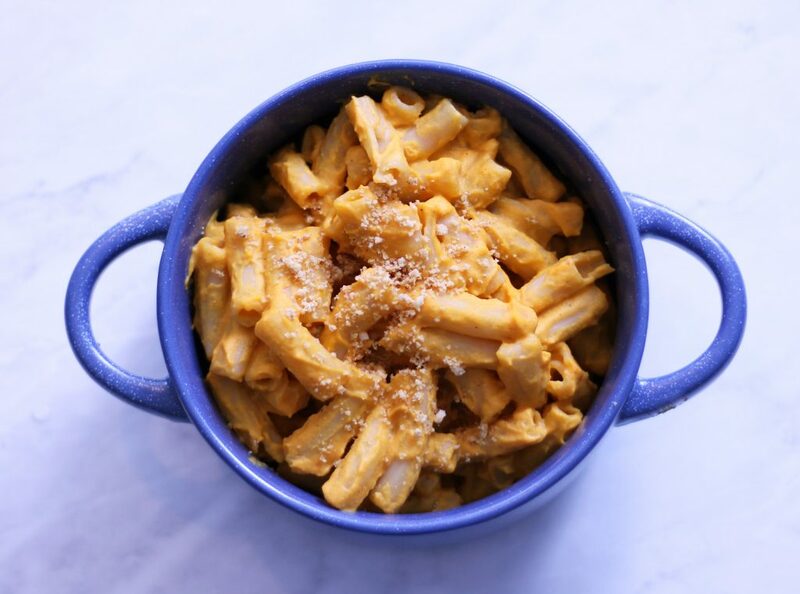 Do you dream of an irresistible savory, surprisingly cheesy, creamy, nut-free, oil-free, and gluten-free vegan mac and cheese to cure you of your insatiable cravings for the real deal? 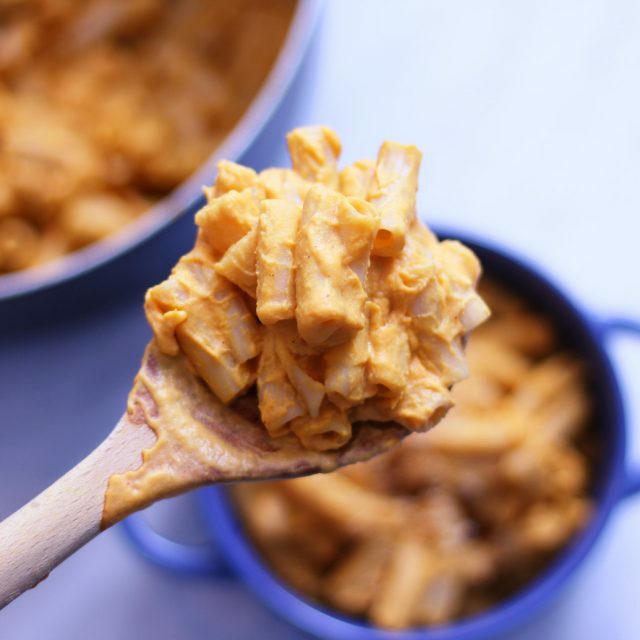 Fear not, because the ultimate recipe is finally here, and you won’t believe how surprisingly healthy it is for you- considering it is sweet potato and tahini based! There are few nights when I come home after a long day of work or school and don’t want to dive head first into a giant bowl of mac and cheese. 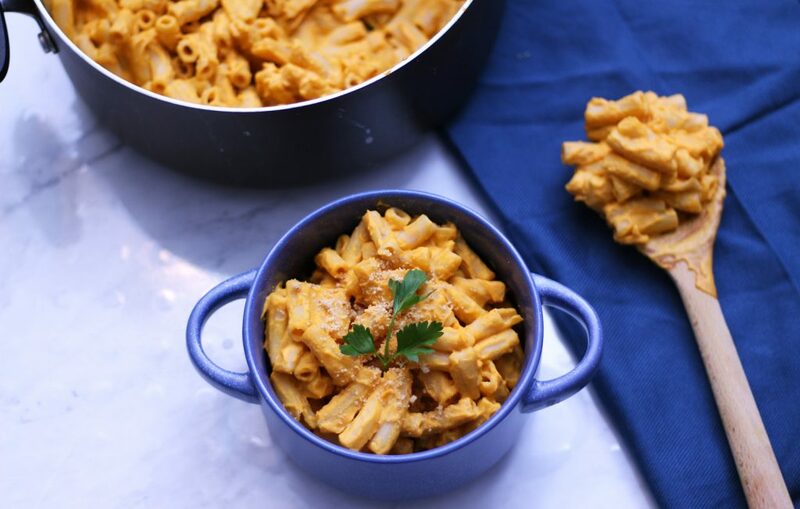 And while avocado mac can satisfy this craving, I wanted to create a vegan mac and cheese recipe that was closer in appearance to a classic mac and cheese that would also be suitable for my friends with all kinds of dietary restrictions. And being the sweet potato and tahini enthusiast that I am, why wouldn’t I combine two of my favorite ingredients to create an irresistible cheese sauce?! The sweet potato is definitely noticeable, but in the best way, leaving an impression without taking away from the cheesy, garlicky flavors at play. This dish comes together in just under 40 minutes, most of that being passive time anyways, and requires only 10 ingredients! And all the ingredients for the magical sweet potato cheese sauce are simply blended to creamy perfection! With school coming to an end soon, although I will have a whole new set of responsibilities, I hope that I will have more free time to invest into my blog! I have so many recipes in the queue waiting to be edited and shared with all of you, and an endless list of recipe ideas I still have yet to test! With the first anniversary of my blog approaching in just about a week (I can’t believe it’s already been that long! ), I have so many exciting new plans to share, including a meal-prep and grocery guide and my first e-book, which will be free to all my subscribers as a gift for all your support! ? I also hope to incorporate more of my personal life into my posts, share tips on how to get started with your own blog, and publish my first restaurant reviews. It’s already been an amazing first year of running Zena ‘n Zaatar, and I can’t wait for what’s in store for the next! I hope you all enjoy this recipe as much as I do! Comment below if you try it and don’t forget to share your recreations with me on Instagram, #zenanzaatar and @zenanzaatar! ? 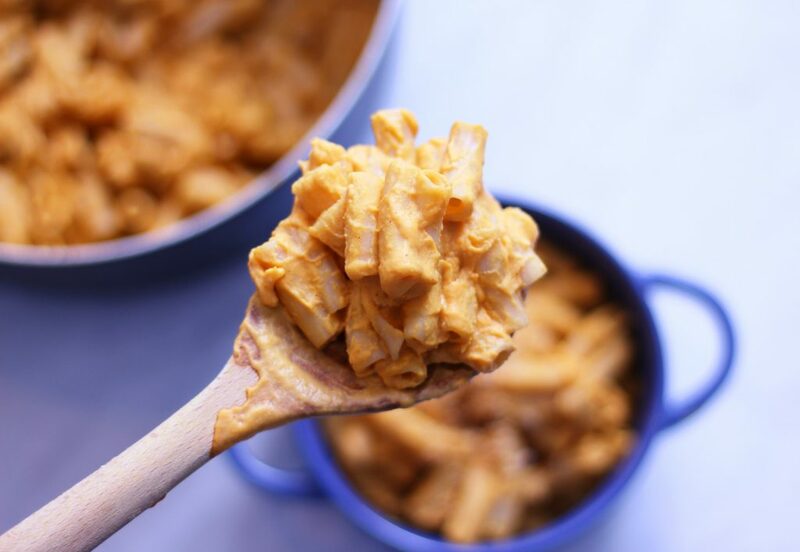 The best ever vegan mac and cheese! Nut-free, gluten-free, oil-free, sweet potato based, and cheesier than ever! Meanwhile, prepare pasta according to package directions. Drain pasta and set aside. Blend all ingredients for sweet potato "cheese" sauce, along with roasted onion and garlic, in a high speed blender until smooth. You may need to blend half of ingredients at a time if your blender is not large enough. If you are having trouble blending or your sauce is too thick, you can add more non-dairy milk 1 tbsp at a time until you reach the desired consistency. Combine pasta and sauce in large pot, heat and stir over medium-high heat if needed, and then serve! 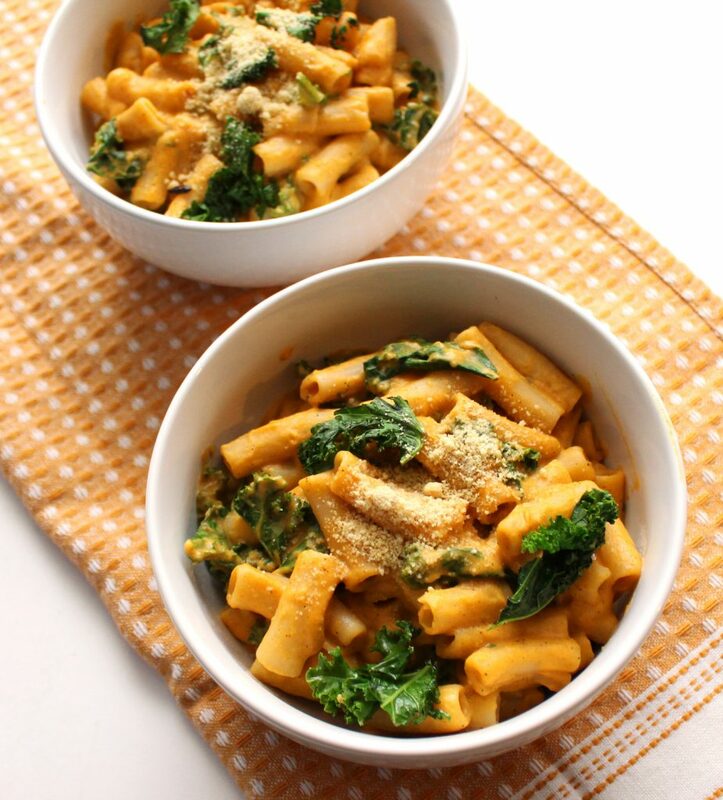 You can top it with or add garlicky kale, roasted broccoli, or your favorite vegan parmesan! **You may wish to roast or cook the sweet potato at this time. You can pierce 1-2 sweet potatoes with a fork and roast them for about an hour at the same temperature. The quicker way is to boil the sweet potatoes. Peel and dice them, then bring a pot of water to boil. Place potatoes in and simmer, covered for 15 mins, or until fork-tender. This looks so yummy! Bookmarked! I made this last night and it was super simple and yummy. needed to use up some sweet potatoes so i made this today and it was so good! 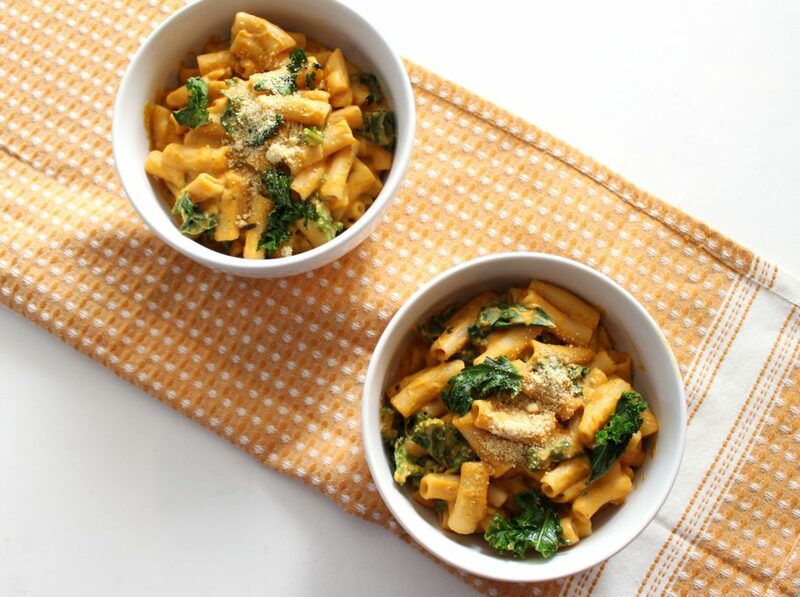 definitely one of the best vegan mac n’ cheese recipes i’ve tried yet. Making this as we speak. Question: the recipe mentions 1/2 an onion but I don’t see it in the instructions. I have a hand of a red onion but I’m concerned with throwing it into the sauce in fear it will turn the color brown? I may omit the onion all together. I’ll keep you posted ;). Can’t wait to see how this turns out!